1G: Choose a card in your hand. Covering the artist's name, reveal the card to target player. If that player cannot name the artist, reveal the artist's name and put a Squirrel token into play. Treat this token as a 1/1 green creature. 1oG Choose a card in your hand. Covering the artist's name, reveal the card to target player. 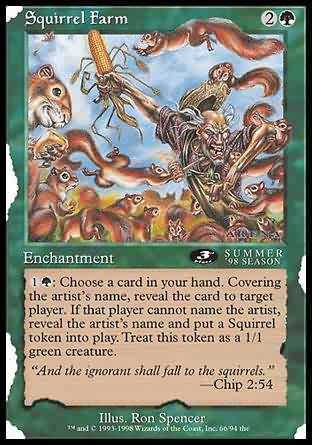 If that player cannot name the artist, reveal the artist's name and put a Squirrel token into play. Treat this token as a 1/1 green creature.